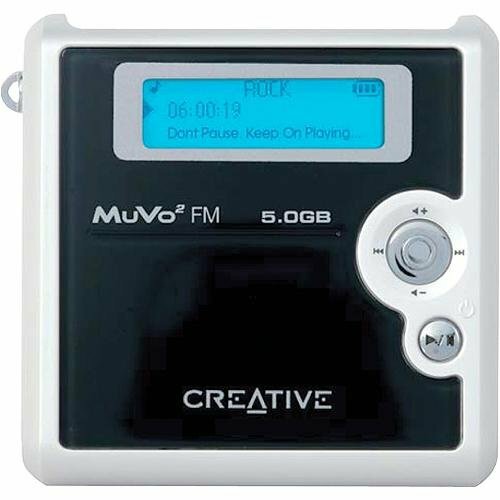 I have a Creative Muvo^2 (image). I paid $250 for it two years ago. It's 4 GB and has a tiny hard drive in it; it's pretty thick, you can't tell from that photo. I toy with the idea of buying a new MP3 player sometimes. Nowadays they have all these fancy MP3 players with huge color screens and upwards of 30GB and about 1/8th the size of mine. But everywhere I look, MP3 players are crippled in one way or another, or else just not worth buying. Either having an unremovable battery, or some kind of DRM scheme, or not being usable as a plain old removable hard drive, or costing way too much. I got lucky with the Muvo. It's survived being all but soaked in water (note to readers: don't use MP3 players in the bathtub) and being dropped dozens of times, constantly bashed around in my backpack and pocket and car. The battery still holds a good many hours charge even after 2 years, and it recharges in less than an hour from what I can tell (and the battery is replaceable by me if it ever goes). The tiny screen is my only real problem with it. Other than that it works fine. I'm a programmer and the biggest computer geek there ever was; why is it that I find gadgets like MP3 players and cell phones so unexciting? I had a cell phone once for 1 month before I got rid of it; other than that I've never had a need for one. I've toyed with getting a PDA but never seriously. All of these little gadgets seem so crippled. You sacrifice a lot for the sake of portability. Does anyone really need to check their email at the bus stop? Or carry a web browser with them 24 hours a day? Or instant message people from the bathroom? Even to me, it seems pointless, and the service charges for all that crap are ridiculous. Apple's new iPhone excited me for all of 12 seconds, then I thought, what's the point? And $600? Insanity. I'll probably keep my Muvo until it stops working, and I'll probably not get a cell phone until I have an employer who demands it of me.